Please excuse the mess – this page is currently undergoing a metamorphosis and is under construction. If you’re interested in Group Classes, Private Training, or our Seminars, please visit our Contact Us page and fill out a contact form or schedule a phone call with us. We truly have something for everyone here at All Dogs Allowed. Our facility allows us to accommodate puppies, socialites, dogs in need of space, special needs dogs, and more! We have worked with various breeds and have no restrictions or prejudices, no matter the shape, size, age, or temperament – your dog is welcome here… and so are you! Welcome to All Dogs Allowed! Where we specialize not only in training dogs but also in improving the dog/human bond and quality of life for all family members! To learn more about us and our team of amazing trainers, hop over to the About Us page. Whether you are looking to teach your dog or puppy the basics, address specific behavioral issues, or just looking to have some fun with your best furry friend, we have something for everyone! Not sure what program or class would be best for you? 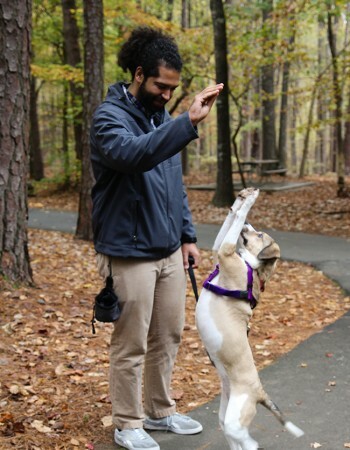 If your dog is in need of basic training, we recommend our Foundations class. If you have a puppy and you’re looking to start them off on the right path, we recommend starting with Successful Socialization or Puppy Starters. These classes will also address common behavioral issues and how to best work on these with your pup. If you have specific behavioral concerns or if your dog is exhibiting reactive or aggressive behavior, we recommend that you sign up for a Private Training Consultation so that our Behavior Specialists can assess your dog in person and make recommendations based on your dog’s specific needs. Every dog is unique, and their training should be too! If you’re interested in a Group Class or Private Training Program, but you’re not sure which one is right for you, please fill out a Contact Us form and one of our trainers will contact you with the best option for your training needs. I am new to All Dogs Allowed, what is the first thing I should do? If you haven’t emailed us or spoken to one of our trainers already, please read through our Getting Started Page – the page you should currently be viewing. Whenever possible, we’d prefer for you to read over this page before purchasing a group class or private training program so you can understand more about how our programs work, what behaviors each program is geared towards solving, and the details of each program. If you have any questions, you can also fill out a contact form or schedule a phone consultation with us through our Contact Us page. Please note, due to our dependable results and the success our clients have with us, our training programs are so popular and sought-after that it may take us several days to return any emails or phone calls. Why do you use positive reinforcement training? For us, training isn’t just about achieving the finished behavior. Building bonds, establishing mutual trust/respect, and helping dogs become more confident & creative are all more important to us than any single cue or command we teach them. Even if it was an undeniable fact that using physical manipulation/force has no negative effect on the dog, and was a faster or more efficient means of getting the final product, we enjoy the byproducts of this kind of training. Do you offer a guarantee on your training? Since we are working with living, breathing beings with minds of their own, it is not responsible or ethical for any trainer to guarantee success in training. Can you guarantee your teenager will never drive one mile over the speed limit, even with the best driving instructor and lessons? Of course not! What we can guarantee is this: we guarantee that we will give you everything you need for success. What you do with it is up to you. Success in training includes many factors outside of our control – your dog’s personality and needs, your goals and whether or not they are attainable, your ability to absorb and implement the training lessons, and, most importantly, genetic breed traits or missed critical developmental windows. Working with a professional dog trainer increases your chances of improving your life with your dog, but there are some behaviors that cannot be removed from your dog – only controlled. While we can give you the skills and tools needed to control these behaviors, we cannot guarantee how often you will put the training into place once we have left. What are the benefits of Group Classes versus Private Training? This question is yet to be answered. Please check back later or contact us for an answer. What are the benefits of Private Training versus Group Classes? This question has not been answered yet. Please check back or contact us for an answer. What are the benefits of attending seminars or events at All Dogs Allowed? This question has not been answered yet. Please check back later or contact us for an answer.